Keeping the theme as the innocent cows, which perfectly match the innocence of the kids to a wide extent. The cow shaped pillows, mats and other furnishing articles perfectly match the attractively printed cupboards and study table. The theme of the kids room is completely based on the greenery and farmland to give your kids the exclusive feel of the cow based them. Our designers have well experimented with the kids wildest imagination and are successful in delivering the things that are mostly preferred. Desc : This sweetest & pillowy face of cow features brown soft horns, standing adorable ears and yellow & white mouth. Her seeking eyes are waiting the little ones, who need a huggable buddy. 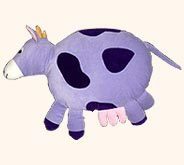 Desc : Baby cow soft toys possess lavender floppy body with blue marks & white mouth. 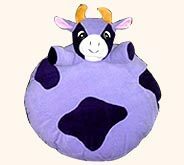 Mischievous kids can use it as pillow and can also enjoy by pulling her small tail & pretending to milk the udders. Desc : This plump & angry looking cow is really soft hearted for innocent children. With white body, black spots, pale horns & red snout , this cow will excite and fascinate babies for a long time. 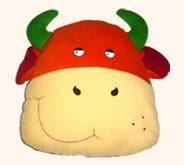 Desc : Featuring red & pale mouth, looped ears, green horns and endearing expressions, this baby cow toy is simple to manipulate. 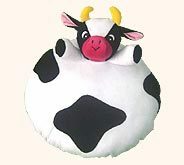 This incredibly soft cow will provide the kids pleasure like the lap of mother. 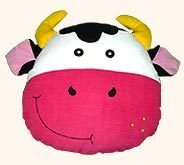 Desc : Stuffed with soft material, soft cow toys have white & pink mouth, on which black eyes, pink folded ears & yellow horns are charmingly stitched. 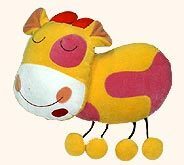 This colorful & cuddly cow is a wonderful choice for any toddler. 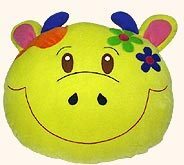 Desc : This delightful kids cow toy is sure to bring a irresistible smile on the face of kids. Yellow colored this cow has brown eyes & pink ears. She has beautified herself with multicolored flowers to allure the tiny totes instantly. 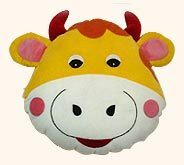 Desc : Full of fun, this soft cow toy is the true friend of all the children. Kids can easily wiggle back and forth just moving her body. They can ride, squeeze and tickle it, but this playful & kind cow never will show anger. Desc : This lavender colored cow has a plump tummy, on which little one can leap, hold their head while sleeping. Very sweet & cozy for all of god's lovely children.